Theme is "engineered to be Ahead" The coming of All New Honda City as a product that is already in excess of what is desired by the customers of a mini sedan class model. 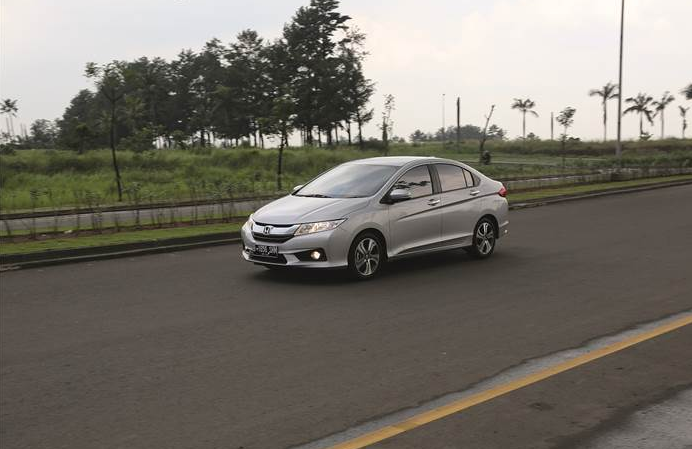 "From first generation to next generation, the All Honda City always brings a good breakthrough design, features and technology in its class. 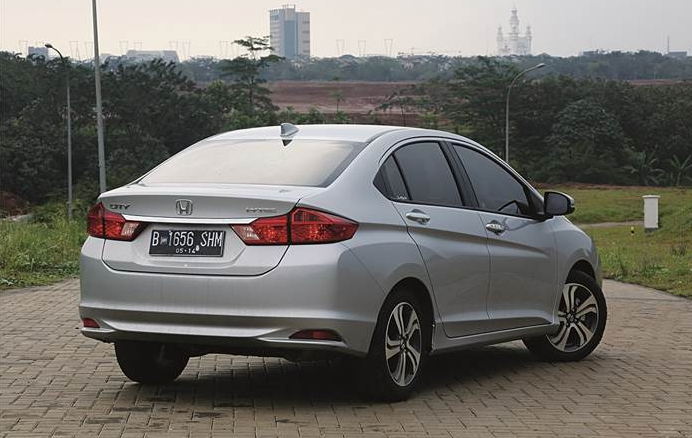 All New Honda City is now offering a new design is more dynamic and sporty, good powerful performance at the same time efficient and environmentally friendly, cutting-edge technologies with advanced features and highest safety levels, ". Separately, Large Project Leader of the All New Honda City, Toshikazu Suda Hiroze of Honda research and Development, Automobile R & D Center, which handles the development of the Honda City explains, if the All New Honda City is focused on the development of the design, fuel efficiency and features. "Then, this car applies "low friction" on the engine and its CVT transmission. Also there are applications that allow the ECON mode B-efficient driving, "said Hirozesan. Hence, the fourth generation, the use of a torque boost resonator has been elliminated. With a more sporty and dynamic design, the exterior of the All New City changes in the headlights, grille, bumper, LED Turning Signal, rear chrome garnish, rear lights, and a rear reflector. a line on the body side that ends at the end corner of the rear lights also give a strong accent on the sporty aspect. Once inside the cabin, very different than previous generations. front and rear leg room following the New City headroom so wide, almost like saloon. silence is also a similar level sedan cabin on it. Design metercluster in panel dashboard looks modern. The back seat is lower than the trunk to get a larger luggage space. AC vents under the rear console box, accelerating evenly cool the cabin when the weather is hot. To increase luggage capacity, there are features rear Seat Fold Down 60:40 to fold flat second-row seat to the trunk floor. One Push button ignition system, simplify the process of turning on and off the vehicle engine. Features Auto AC Smart touch digitally adjust cabin temperature which speeds up the cooling process by taking into account the temperature outside the vehicle. Meter cluster consists of three display meters that provide a variety of information accurately and easily monitored. LCD multi-information display shows a set of necessary travel information, such as mileage, average fuel usage, distance can still be reached with the remaining fuel in the tank and so on. Quite informative and useful to help motorists in everyday life. 'Smart key system' also allows the driver to open the door of the vehicle. 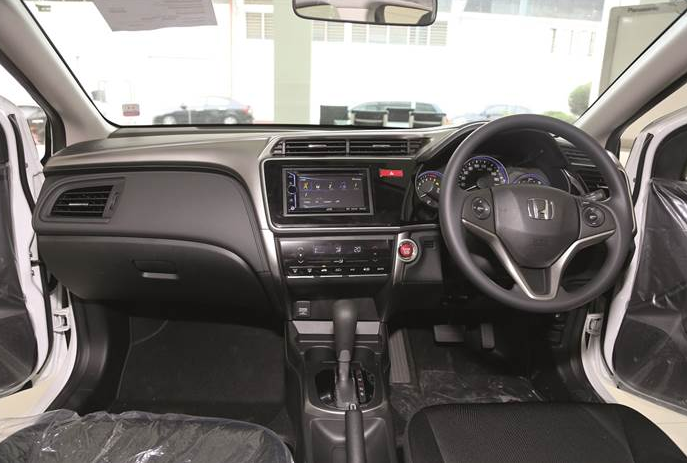 We also feel the joy of the music coming out of the audio system the touch screen 6.1 All New Honda City enabled all the audio-visual format and compatibel with iPod and iPhone. Concentration while driving is not broken, thanks to the audio steering switches on the steering wheel. One other thing that is satisfactory, the performance 1.5L SOHC i-VTEC engine that produces power of 120hp and a maximum torque at 145Nm 6.600rpm on 4.600rpm. On the occasion in a straight path rather empty, we tried a responsive acceleration. 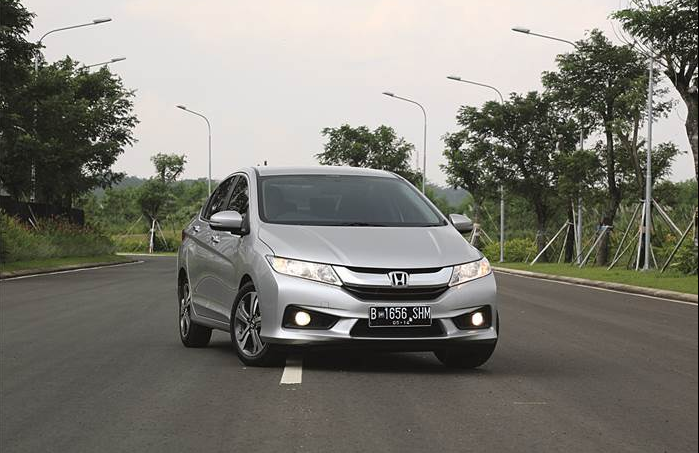 amazing again, the ability of handling the All New City is already close to his brother, the Civic. The movement of the steering wheel so light, and body as by course when doing extreme maneuvers. All New City CVT transmission which adopts Dream earth technology supporting engine performance. thanks to the application of this technology, the structure of the new transmission and lighter weight, the transmission shift smoother, more efficient in fuel consumption, as well as maximum engine performance. Indeed, I also had to try the paddle shift feature that adds to the pleasure of driving. CVT transmission is also supported Drive by Wire technology that regulates opening and closing the throttle valve for maximum precision acceleration yet fuel efficient. Grade Logic Control features and Shift Hold Control set the optimal performance of the CVT that passed the corner and climbs to more fuel efficient. Features include ECON Mode ECON button and Eco Assist maximizes efficiency by up to 20 percent. Where Drive by Wire system will adjust gradually, including the transfer of transmission and air conditioning more efficiently. 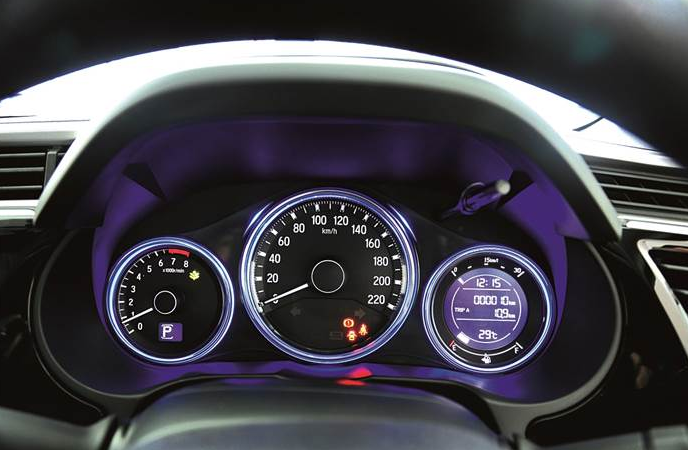 ECO Assist gives instructions to the driver to save fuel when driving, in which the indicator will turn green when the style of driving already efficient at all. One thing that makes us confident driving the All-New City, completeness active and passive safety features are complete. The braking system ABS, EBD, BA, VSA which prevents understeer and oversteer, HSA which prevents the car back when the ramp, and turn on the hazard lights ESS when there is sudden braking. There is also a brake override system that detects when the accelerator and brake at the same trodden that automatically prioritize vehicle braking so easily controlled. For passive safety, there is a frame-tech G-CON + ACE is able to spread the energy of the collision, dual front SRS Airbag, Side Airbags System I-Curtain airbags and Side (special type ES), Seatbelt with Load Limiter Pretensioner, as well as ISOFIX and tether to lock baby seat in the backseat.